Houston’s features freshly made soups everyday! 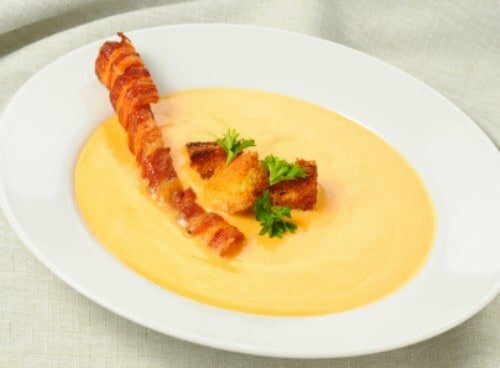 Cheese soup is a creamy and rich soup, this goes so well with a piece of crusty garlic bread. You can make Houston’s Canadian Cheese Soup at home with this copycat recipe. Melt butter in a Dutch oven. Add the carrots, onions and celery all at once. And saute until soft but not brown. Add flour and stir to combine. Cook until mixture begins to turn a light-brown color. Over medium high heat, add the chicken broth a little at a time. Stir and continue to cook and stir with a whisk until a thick base is formed. Add half and half being careful not to let boil. Add cheese, stirring until melted. Just before serving add parsley. Garnish with diced tomatoes and jalapenos if desired. You have great taste buds. I love Houston’s. I’ve seen a few posts for them. Thanks so much. Any luck with the French Dip sandwich?